A massive congratulations to our colleague and Tour de Yorkshire ride leader Kyle Spencer who completed his first Ironman triathlon in an amazing time of 13 hours, 27 minutes. 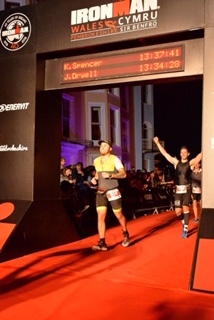 Kyle was amongst 2,400 athletes taking part in the Ironman challenge in the scenic harbour town of Tenby on Sunday September 15. During the event Kyle completed a staggering 2.5 mile open water swim, 112 mile cycle ride, before finishing off with a 26 mile marathon – raising valuable funds for cancer support in the process. Earlier this year, Kyle was part of was part of a ten strong team of employees from Wakefield Acoustics who completed a gruelling 129km cycle challenge – raising over £4K for Leeds cancer charity Maggie’s Centre. Kyle, Jamie Gibson, Matthew White, Alan Gibson, Lee Nicholson, Abbie Clarke, Kevin Dawson, Jane Dawson, Paul and Kay Hebden, cycled a challenging route which included a punishing 6700ft of climbing across Yorkshire, on Sunday May 6, as part of the Maserati Tour de Yorkshire Cycling Sportive.